Another abuser may have fallen, but accountability comes decades too late. According to some of his victims, Moonves abused his power over professional women for more than 30 years. That’s three decades of alleged sexual harassment and battery, and it doesn’t simply go away with his termination. The six victims about whom we know are likely just the tip of the iceberg. The harm Moonves is alleged to have caused was catastrophic. According to his victims, he had no qualms about shutting down those who spurned his advances, and we’ve already heard of at least one victim whose career she says he ruined. Unquestionably this kind of conduct causes extensive economic and emotional harm. In fact, what Moonves didn’t seem to care about was that sexual harassment, battery, and retaliation wreak havoc on victims, changing the course of lives and harming families. In addition to loss of jobs and opportunities for promotion, Moonves’s victims report that they have endured pain and suffering, harm to reputations, loss of connections and community. No monetary payment will erase these injuries, but compensation for the harm Moonves reportedly caused would assist in the healing process by enabling the victims to obtain therapy, and by restoring dignity through accountability. Plus, taking care of the victims is the right thing to do. Unfortunately for many of Moonves’s victims, the statute of limitations for gender-based harassment has passed. Of course, this means that the legal system does not currently provide a compulsory process to hold Moonves and CBS accountable for the victims Moonves harmed some time ago. Powerful predators count on their power to act as a deterrent against their victims speaking out, by creating fear of further harm being inflicted on them. Why should the predators be rewarded for their abuse by the lapse of time? Recall the public outcry more than 15 years ago when adult victims of priest-on-child molestation began sharing their stories. The predators had been able to evade prosecution because statutes of limitations failed to take into account the fact that victims did not understand or feel able to talk about what they had experienced, only coming forward as adults to name their attackers. 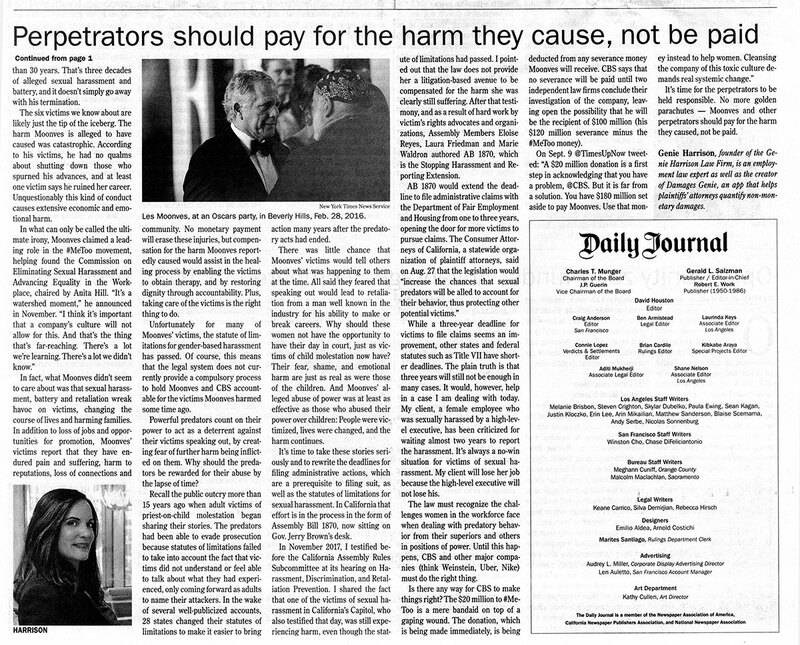 In the wake of several well-publicized accounts, 28 states changed their statutes of limitations to make it easier to bring action many years after the predatory acts had ended. There was little chance that Moonves’s victims would tell others about what was happening to them at the time. All said they feared that speaking out would lead to retaliation from a man well known in the industry for his ability to make or break careers. Why should these women not have the opportunity to have their day in court, just as victims of child molestation now have? Their fear, shame, and emotional harm are just as real as were those of the children. And Moonves’s alleged abuse of power was at least as effective as those who abused their power over children: People were victimized, lives were changed, and the harm continues. It’s time to take these stories seriously and to rewrite the deadlines for filing administrative actions, which are a prerequisite to filing suit, as well as the statutes of limitations for sexual harassment. In California that effort is in the process in the form of AB 1870, now sitting on Governor Brown’s desk. In November 2017, I testified before the California Assembly Rules Subcommittee at its hearing on Harassment, Discrimination, and Retaliation Prevention. I shared the fact that one of the capital’s sexual harassment victims, who also testified that day, was still experiencing harm, even though the statute of limitations had passed. I pointed out that the law does not provide her a litigation-based avenue to be compensated for the harm she was clearly still suffering. After that testimony, and as a result of hard work by victim’s rights advocates and organizations, Assembly Members Eloise Reyes, Laura Friedman, and Marie Waldron authored AB 1870, which is the Stopping Harassment and Reporting Extension. While a three-year deadline for victims to file claims seems an improvement, other states and federal statutes such as Title VII have shorter deadlines. The plain truth is that three years will still not be enough in many cases. It would, however, help in a case I am dealing with today. My client, a female employee who was sexually harassed by a high-level executive, has been criticized for waiting almost two years to report the harassment. It’s always a no-win situation for victims of sexual harassment. My client will lose her job because the high-level executive will not lose his. The law must recognize the challenges women in the workforce face when dealing with predatory behavior from their superiors and others in positions of power. Until this happens, CBS and other major companies (think Weinstein, Uber, Nike) must do the right thing. Is there any way for CBS to make things right? The $20 million to #MeToo is a mere bandaid on top of a gaping wound. The donation, which is being made immediately, is being deducted from any severance money Moonves will receive. CBS says that no severance will be paid until two independent law firms conclude their investigation of the company, leaving open the possibility that he will be the recipient of $100 million (his $120 million severance minus the #MeToo money). It’s time for the perpetrators to be held responsible. No more golden parachutes – Moonves and other perpetrators should pay for the harm they caused, not be paid. 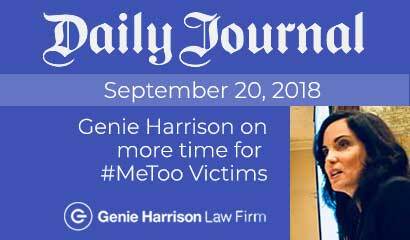 Genie Harrison, founder of the Genie Harrison Law Firm, is an employment law expert as well as the creator of Damages Genie, an app that helps plaintiffs’ attorneys quantify non-monetary damages.